Caterpillars are prepared for eating by squeezing out the gut contents before they are fried in their own body fat or boiled in a little water. Most of the caterpillars are dried so that they can be stored for use throughout the year. Dried caterpillars may be eaten dry as a snack or rehydrated and cooked in a little water before they are fried in oil with onion and tomato. They may be served with pap (maize meal porridge), onion and tomato gravy and atchar (chili sauce). 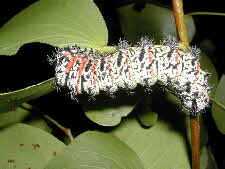 Nutrition: Mopane worms are about 60% crude protein, 17% crude fat, and 11% minerals, on a dry matter basis.